I made a covenant with mine eyes; . . .
We all know that a covenant is a sacred agreement between God and a person or group of people. God sets specific conditions, and He promises to bless us as we obey those conditions. When we choose not to keep covenants, we cannot receive the blessings, and in some instances we suffer a penalty as a consequence of our disobedience. So, how do we make a covenant with our eyes? Are you really making a covenant with your eyes, or are you making a covenant with God about what you will do with your eyes? There are multiple times in the scriptures where the Lord addresses this topic of wandering eyes. Here are just a few. The story of David and Bathsheba provides an excellent example of what can happen if we don’t honor the covenant we have made with our eyes. I have italicized a few words to point out the progression David went through on his path to sin. At any point he could have turned back and kept his covenants. We progress down the same path when we don't honor our covenant by turning away when we first are tempted. David was supported to be someplace else. It was the time for kings to go forth to battle and David was the king. Always be in the right place doing the right thing. David saw the woman washing herself. Every man and young man will see things throughout the day that have the potential to damage his spirit. 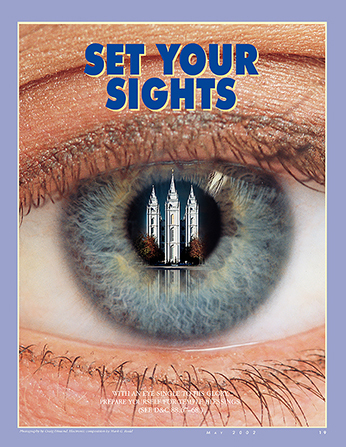 It is nearly impossible to avoid seeing things that could damage your spirit. The key lies in what you do next. If you immediately honor the covenant you have made with your eyes and look away, then you are moving to safer ground. David didn’t look away and move on, he continued to look long after he saw. This is were the problems really start. We need to train ourselves to look away. David may have been fine if he had lingered, but the lingering generally leads to action. His action was to inquire about her and finally send for her. We do something similar when we linger on web sites and then continue to click through to find more and more salacious material. Elder Oaks gave us this advice. If we will honor the covenant we have made with our eyes, then we avoid the traps, pitfalls, and dangers that come by progressing farther down the path that eventually leads to unhappiness, sin, and regret.